In looking forward to our 100th anniversary, the Linly Heflin membership has reflected on our past. 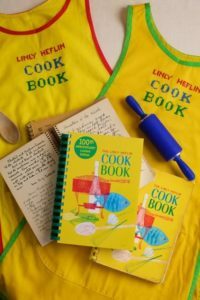 One of our most successful fundraisers over many decades was the sale of The Linly Heflin Cookbook, first compiled and printed in the 1940s, and this edition first published in 1962 was reprinted eight times over 19 years. Now we are offering it once again, as we continue to provide a bright future to our scholarship recipients. To order your limited-edition copy, or a few for gifts, click the PayPal button below. Note: There are two options, one with shipping added and one without. Arrangements for pickup will have to be made for the latter option. Please use drop down arrow to show price with shipping included if you do not plan to pick up your purchase. Price with shipping is $24.95 per book.